Kano Pillars made another fruitless journey to Nnewi, this time getting two goals at the back of their net courtesy of last term’s goal king Godwin Ogabje’s brace. The Anambra Warriors, by virtue of the victory, extend their unbeaten run to 8 matches. The longest in the club’s history and also hold the longest unbeaten streak this season. Meanwhile in Jos, Plateau United extended their lead on the log by getting one past Remo Stars who are at the base of the log. They now top the league table with three points after 21 weeks. 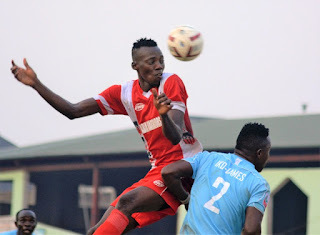 Ajibola Otegbeye’s second half penalty decided proceedings in Akure as Sunshine Stars beat rivals Enyimba who were a second away game on a row. The host played without their fans in the stand and one would have predicted a point or more for Enyimba, regrettably their profligacy in front of goal paid for their futile journey. 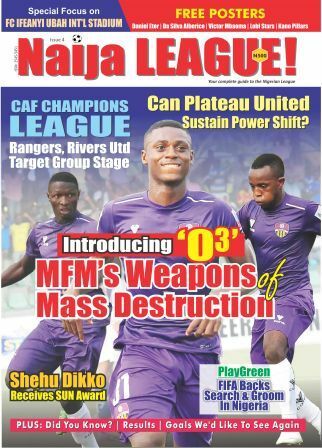 It was not the result Rivers wanted in Maiduguri. Samuel Mathias and Bala Yahuza gave El-Kanemi the win, but Onoriode Odah restored one for the Pride of Rivers as a consolation goal in the encounter. Odah’s strike brings to an end Rivers United FC’s goal drought on the road. It was all home win in Matchday 21 and the biggest winner was, no doubt, Abia Warriors who pummeled Oriental Rivals Rnagers Int. 4-0. Rivals, Rangers International in Umahia. Sunday Adetunji got the opener for Abia Warriors immediately after Ebuka Okeke of Rangers was flagged off-side in front of goal. Sunday Adetunji handled the ball at the edge of Rangers box to send it home over the head of Rangers goalie Seidu Mutuwakilu. The homers got their second through Anthony Okemiriri who got an assist from Uche Ihuarulam and calmly jabbed the ball home. The break was observed with Abia Warriors two goals ahead of the Enugu side. Abdulahi Biffo’s lads got their third from club’s highest goal scorer Sunday Adetunji. They, however, sealed their lead convincingly in the 86th minutes after Obi Samson got his first goal for his side by scoring from a rebound that graciously fell on his lane. The win is Abia Warriors biggest win since two years when they defeated Nembe City by same score line. At the end of the day, defending champions, Rangers International are placed 15th on the log while Abia Warriors are spotted in the 8th position with 31 points from 21 games. The Umahia based side will take a road trip to Katsina for a date with Katsina United while Rangers will hope to go back to the drawing board to prepare for their next gueat, Nasarawa United.